We are proud to offer our clients, for when those unplanned major repairs can derail your budget, great Consumer Financing options from Synchrony Bank. 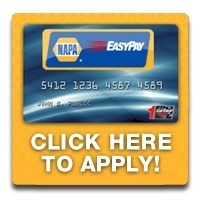 This benefit comes to you because we are a NAPA Auto Care center. You can select from either 6 month or 12 month financing options, both with Zero 0% Financing (and zero fees). Apply when you visit where can process your application! A powerful advantage to putting ALL your automotive repairs and preventative maintenance onto your new NAPA Auto Care 'Easy Pay' credit card is that you are eligible for an extended warranty of up to 36 months on parts and labor for most work done on your vehicles!